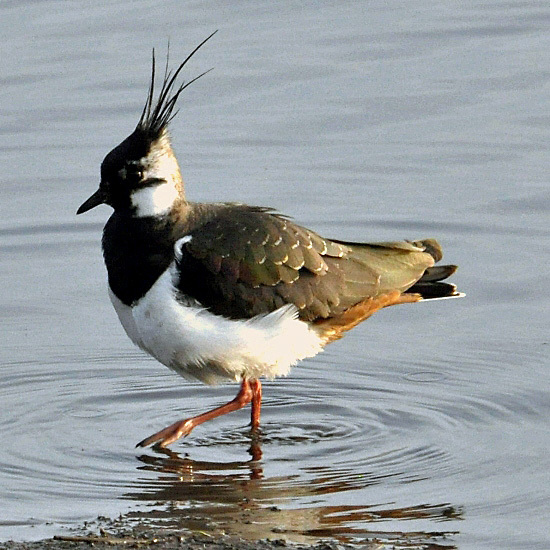 The Northern Lapwing, commonly referred to as simply Lapwing but also known as the Peewit (because of the sound of its call), Lapwing Plover, or Green Plover, is a large wading bird seen most frequently on ploughed fields, in corn stubble and on cropped grassland. Once very common and abundant, this lovely bird is now very scarce in Britain; those that are seen here in summer are mainly resident all year round, and they are joined in winter by migrants from mainland Europe. The upper body of this bird is a beautiful iridescent dark green and purple, although seen on a dull day, especially from a distance, it can appear to be almost black. The breast and cheeks are white and the under-tail coverts are an orange-brown colour. Its longish legs are pink. Males and females are very similar, but the male has a taller crest, a darker breast and a paler face than the female. In flight these birds are unmistakable, as their broad wings beat very slowly and they often roll, dive and spiral in impressive acrobatic displays. 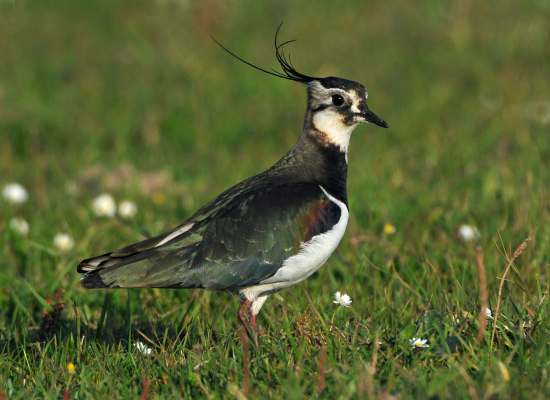 Lapwings feed on worms, beetles, caterpillars and other small invertebrates on the ground or just beneath its surface. Lapwings nest on the ground, in shallow hollows usually in an open meadows or on marshland. Both the male and the female incubate their eggs and feed their young - typically three or four in a brood. Young Lapwings are amazing little creatures: they are able to run almost immediately after emerging from the egg. This page includes pictures kindly contributed by Chris Monks and Ray Tipper.